If there's a star of The War of the Worlds, the upcoming downloadable title for the Xbox 360 and PlayStation 3, it's someone working behind the scenes or above the action. It's the score by Chris Hülsbeck, or the writing by Chris Fowler or, not least, the narration by Patrick Stewart. As a game, however, what I saw of The War of the Worlds is a bit too much of an homage to side-scrolling platforms and puzzles to take it far beyond the interactive retelling of a science-fiction classic, albeit one carrying a lot of polish. In the level we saw demonstrated at E3, the protagonist (named Arthur Clarke and dressed to resemble Carl Sagan) was trying to traverse Hyde Park, blasted through with craters by the invading Martians. The only color shown was applied to Martian technology; anything of Earth was desaturated. Yellow death rays strobe-lit the background, heaving up enormous silhouetted chunks of dirt and debris. The foreground path was one of giant pits, overturned tanks and weaponry, and exposed pipes. 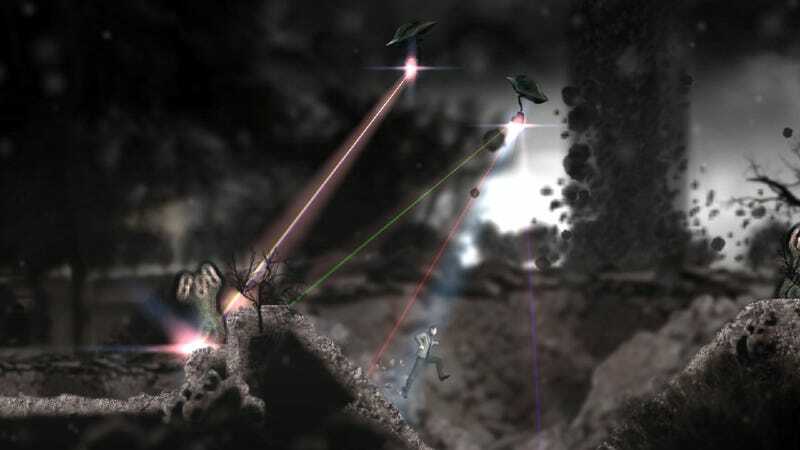 This created hiding spaces for the player to avoid the searchlights on the floating Martian drones, whose ray weapons incinerated the panicked soldiers about the scene. The pause between a drone recognizing you and activating its ray seemed slow enough that, running across the screen, you could cross their light without being incinerated instantly. Many of the sequences required a vertical escape, though, but success there was simply a matter of timing the drone's passes. Save points would be spaced out roughly every 20 seconds, we were told, which is sensible for a game with such a heavy narrative component. Who wants to hear whole pages of text repeatedly as they try to master a jumping puzzle, after all. The climactic sequence was another timed-movement challenge, set on a huge Martian apparatus at the park's center. The hero had to scale it, essentially a giant wheel, and plant explosives at several key points while passing through moving rings whose force fields, when activated, would vaporize him. We saw the mission succeed and the chapter end. Clarke, we're told, is on a mission to find his fiancée and brother. Later in the game he will be able to turn the Martians' technology on them, so the 11 levels will not all be evasion and defense. The more famous alien threats, such as the black smoke, red weeds, and the fearsome tripods, will all make appearances,m though we weren't shown them. The course Clarke takes through London will be actually walkable in sequence, drawing from Fowler's stature as an expert writer of that city. In gameplay alone, what I saw of The War of the Worlds appeared intriguing but not necessarily exciting, even accounting for its deliberate homage to 8-bit platformers. It struck me as an interactive graphic novel, although one buttressed by some real writing and acting heft. Originally conceived in a 16-bit throwback style, Other Ocean moved to rotoscoped models and animations when they realized how much the consoles could handle. An information sheet extolls the fact each level "contains over 40 layers of 2D parallax." When it arrives, the real point for acquiring War of the Worlds may be Patrick Stewart, a figure of profound eminence among the science fiction community. The man could read a Chinese take-out menu and give gravitas to the cashew chicken and potstickers. Here he works with a writer both natively familiar with London and period-perfect in his style. Stewart read 23 pages of dialogue, written by Fowler, so even though he isn't acting a playable character, per se, this isn't a cameo. The gameplay I saw may not recommend The War of the Worlds on its own, but the storytelling, in the hands of this studio, delivered in a downloadable game, wins it some benefit of the doubt.